I love academia. So much so that I keep coming back to it in one form or another. As I begin another degree this fall, I wonder what is it that pulls me into the university one course of study after another. In part, it is that I like reinventing myself. And academia offers a place that allows radical reinvention but with the familiar continuity of college life. I’ve gotten to become both a literary scholar and a scientist through formal study that included classes, tests, papers, mentorship, and a built-in community of like-minded people. Now I am going to work at being a writer with all that same structure. Sure you can (possibly more) effectively reinvent yourself outside of academia. This summer, I met many amazing and successful writers who started their adult lives in an extremely disparate field. They didn’t go to college to legitimize their change. Rather, they jumped off the known into unmapped terrain that they had to chart themselves, as they went along filling it with community and support and knowledge. And words. Lots of words that had to come out of them without deadlines or grades or readers. They had to create things that weren’t guaranteed to get them a tangible reward. It’s scary to reinvent yourself without assembly instructions. You have to pay attention. However, I’d argue that you have to pay equal attention even if you have the instructions via a college program. It’s easy to get caught up in the steps, thus missing the actual living. I know plenty of MFA grads whose theses are the only written work they’ve crafted. Life isn’t on hold when you are in school. It just has a little more structured support. But you have to pay attention. When I look back at the various degrees I have, I notice that I began each course of study because I was tired of where I was and what I was doing. I wanted a new life. I wanted a new me. And I wanted a structured place to do the work for me. In a lot of ways, I didn’t want to pay attention, so at the end of my degree, when I was officially a professor of English or a scientist, I was still also very much the me I was trying to reinvent in the same situation I was trying to escape. In going to college primarily as an escape, I failed to pay attention. Thus, I failed to take full advantage of the benefits of the academic community. I wouldn’t go as far as to say I would have been better off having not gone to school, but I do think I would have gotten more out of my programs if I had paid more attention to life rather than assuming it would happen after I graduated. In small part, this new degree is driven by that same desire. But it is also more intentional and measured. I pay better attention to myself, my motivations, and the world around me these days. I already know that I don’t need an MFA to be a writer: I have a book already written; I continue to amass friends and contacts in the writerly community; I already collaborate with great writerly (and scientific) minds, creating some exciting new stuff for later this year and next. I have already reinvented myself. And realize that as a writer, I will continue to do so my entire life with each new story I put to paper. I also know that academia is more than an escape for me. It is the one continent (of many) on the map of writerly life where I enjoy exploring and living. Because I am paying attention, I realize that a very big reason I return to academia is less about escape and more about coming home. *note: I’m currently reading S by Doug Dorst and J.J. Abrams. It’s been on my “to read” bookshelf/pile for about a year now. I haven’t finished it yet, so I can’t comment on the actual story. But I am utterly in love with the idea and execution. Oddly enough, in 2009 (the year Abrams approached Dorst) I had a similar “wouldn’t it be cool to write a book about two people meeting and falling in love in the margins of library books” thought. I couldn’t figure how to pull it off. Reading S makes me totally in awe of how well Dorst (and Abrams) managed to do this. 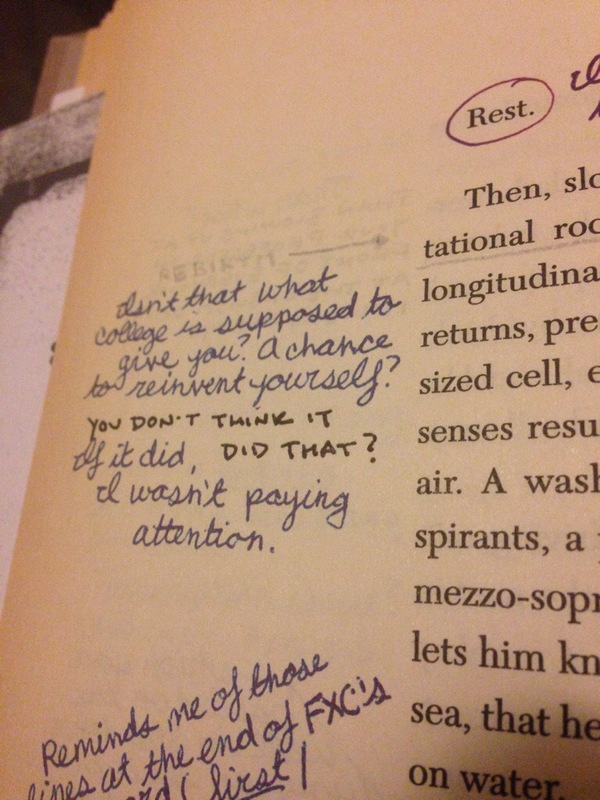 Tags: books, marginalia, writing (meta). Bookmark the permalink. “I do think I would have gotten more out of my programs if I had paid more attention to life rather than assuming it would happen after I graduated.” YES! “…a very big reason I return to academia [and writing?] is less about escape and more about coming home.” YES! YES! YES! I want to come visit and hear all about it. And drink great wine and visit breweries.